UCF has developed a comprehensive FTCE General Knowledge Review Program to empower teaching professionals and prospective students with the knowledge to receive high scores on the FTCE General Knowledge exam's English Language Skills, Reading, Essay and Mathematics sections. 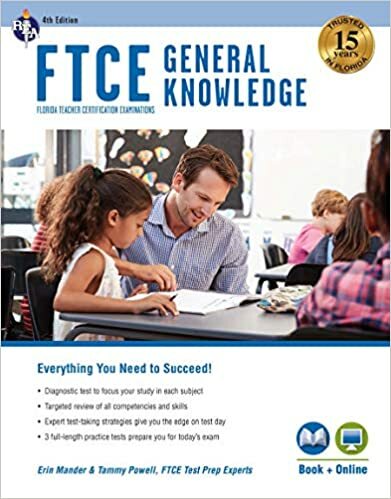 Our FTCE General Knowledge Review Program is taught by professional educators who are able to connect with the class to convey important test information and explain test-taking strategies that are easy to remember and apply. Participants can enroll in the FTCE General Knowledge Review Series (8 sessions) or individually in either the English Review Program (4 sessions) or Math Review Program (4 sessions). Registration is on a first come first serve basis and seats tend to fill up quickly. Register early as both the IN-PERSON and ONLINE sessions have a cap on enrollment. This course will provide the same test strategies that are listed in the review programs for English and Mathematics below. Both in-class and online students will have access to an online repository of resources throughout the English and Math courses. This course will provide a framework for successful test taking strategies for conceptual understanding and mastering the concepts applied to English Language Skills, Critical Reading and Essay sections. Both in-class and online students will have access to an online repository of additional resources throughout the course. This course will provide exercises to aid the process of mastering the concepts of all four math domains (number sense, concepts, and operations, geometry and measurement, algebraic thinking and coordinate plane, and probability, statistics, and data interpretation). Both in-class and online students will take an online diagnostic test before starting the FTCE GK Math review program. The diagnostic is intended to assess foundational skills needed to succeed in the FTCE GK Math domains. Based on the results, both IN-PERSON and ONLINE students will have access to an online repository of resources to help improve their areas of weakness. *Please note students should have a 4th grade math knowledge level before taking the FTCE Mathematics review course. Tammy is the instructor for the FTCE General Knowledge Mathematics and FTCE Elementary Education K-6 review programs. They went above and beyond what I thought would be provided by the instructors. FTCE General Knowledge English and Mathematics Review Course When Ddropping a course, cancellation/refund requests must be made in writing to the Continuing Education business office no later than five business days prior to beginning of the course. An administrative fee of 25% of total registration fees will be deducted, with a minimum administrative fee of $25.00 (whichever is greater).